One of the things I really like about working from home is that I have the option of making something light and tasty, to eat for lunch, and this recipe is one that I love. To be honest, the tuna rosti was first made as tuna fishcakes. But then I realised they could easily become a type of tuna rosti too. Either way, they are light, tasty, super quick to make and pretty inexpensive too! Great if you are trying to keep to a budget. This lunch is also incredibly good for you too. Eggs are a very good source of inexpensive, high-quality protein. 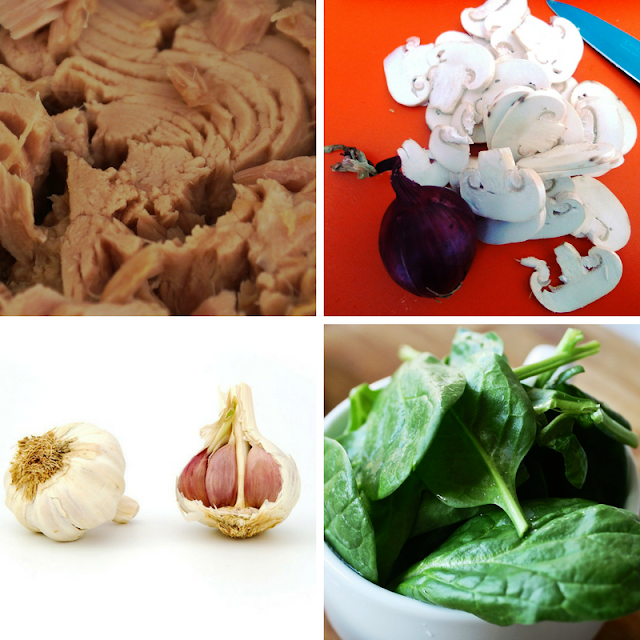 Spinach is an excellent source of many vitamins plus iron and fibre. And some of the many health benefits of tuna fish include its ability to reduce cardiovascular conditions, lower blood pressure and boost the immune system, So as long as you choose a sustainable and ethical option its a great choice for lunch! Makes 8 rosti but we just used two of them for lunch. Wash, peel and chop the potatoes into small chunks. The boil until just soft. Chop the onion and saute until soft. Roughly mash or grate the potatoes, onion and tuna together. Add an egg and stir well. Cut into round shapes (makes approx. 8) I use a round pastry cutter. Place on baking tray and put in over for 15-20 mins - until they start to brown. Slice the garlic and mushrooms and fry in a little oil for 5 minutes. Poach an egg in boiling water. Swirl the water around before adding the egg. Takes a couple of minutes to cook leaving the yolk runny. Wash and gently cook spinach - I put mine in the microwave for 30 seconds. Place the spinach on the bottom of a bowl or middle of a plate, add a rosti and encircle it with garlic mushrooms, then top with a poached egg. What quick and easy lunches do you like making? I'm after some new tasty meal ideas so this is great! Looks yummy as well as being good for you! I usually have a quick salad for lunch! Tryin this would make a difference to my daily routine haha! 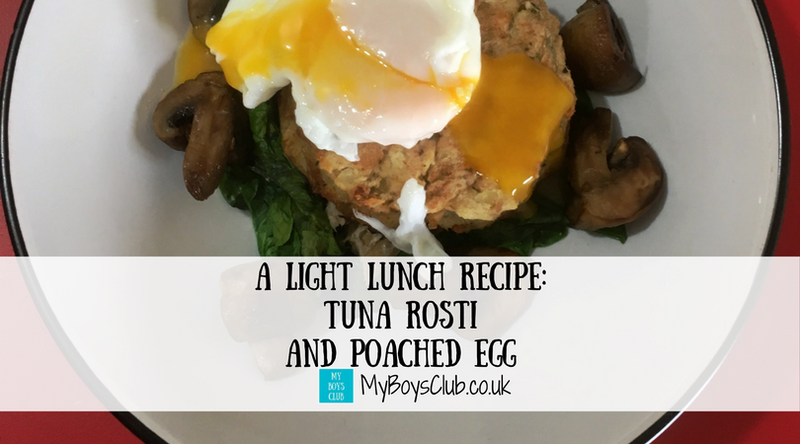 I only recently made rostis for the first time, will definitely try Tuna ones next - they sound delicious! This sounds super tasty! I may have to try this and see if I can get Lucas to eat some too! Oooo that looks bloody delicious!! Love the idea of tuna rosti - I've never had it before.